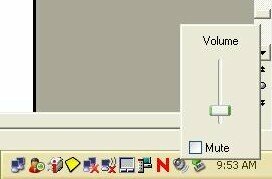 If you're not getting sound from your computer, the first thing you should do is to make sure that your speakers are not set to mute or that the volume is not turned all the way down. I know it may seem silly, but some times the silliest things are actually the ones that happen. 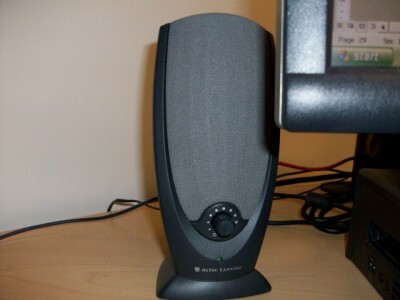 Just go to the speakers icon on the bottom right corner of your computer screen and click on the speaker icon once, see bellow. Check to see that the volume is not all the way down or muted. If you have external speakers, and the volume of those speakers are turned up, you still won't hear anything unless you fix the volume in your computer (see previous step). If both your system tray speakers and external speakers have volume and you're still not getting any sound, check your connections. Make sure the speakers are connected and getting power. Try also restarting the computer if everything is connected and your sound still fails. If for some reason the steps mentioned above do not fix the problem, try connecting the speaker to another computer that works. If you still dont get any sound, this means that your speakers are bad and need to be replaced. If you do get sound, it means that your sound card on your computer is bad and you need to replace it. If the speakers are connected to the built in sound of the motherboard, you will have to install a sound card to replace it (see how to build your own computer section).